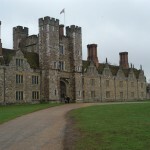 Knole is an English country house originally built between 1456 and 1486 by Thomas Bourchier, Archbishop of Canterbury. It was bequeathed to the See of Canterbury after the death of James Fiennes, the original owner of the site. Over the next fifty years, the house expanded with the addition of a large courtyard, and in 1538 the property was obtained by King Henry VIII. In 1566, the property passed to Thomas Sackville, cousin to Queen Elizabeth I. The house was remodeled by the Sackvilles in the early 17th century and it has remained in the family ever since. Knole is traditionally known as a “calendar house,” having more than 365 rooms, 52 staircases, 12 entrances and 7 courtyards. The appearance, furnishings and architecture have remained largely the same since the 17th century. For example, one of the rooms open to the public contains a collection of 17th-century royal Stuart furniture. Some of furniture is from the royal palace of Hampton Court. The organ in the late medieval private chapel is one of the oldest playable organs in England. 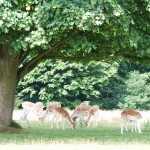 The surrounding landscape has also retained many of its late medieval attributes; the overall shape of the surrounding deer park, for example, has changed little in the past 400 years. 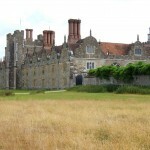 Visit the National Trust’s webpage for visitor information, and check out the Knole Conservation Team’s Blog for information on current preservation work.